A high standard for what constitutes great art was set when Margot was very young. She grew up in a home where art flourished, but because of her father’s work with the Joint Distribution Committee rescuing and resettling Jews during and after WWII, home was constantly changing. By the time she was 22-years old, she had lived in seven countries and fourteen cities, including Prague, Budapest, Paris, Rio de Janeiro and Geneva. Her father was also a talented sculptor who kept a studio in every city. Visits to art museums and to view public art were weekend rituals – one of her earliest art memories was seeing the “Winged Victory” at the Louvre. 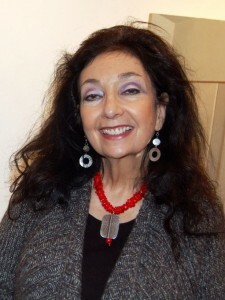 Her family in Rio de Janeiro, Margot returned to the United States to attend the University of Michigan, where she received a BA in French literature in 1962. After graduation she moved to New York City where she worked at a publishing house – her fluency in Portuguese landing her a position editing a Portuguese-English dictionary. Still something was missing. She picked up an evening sculpture class at the Art Students’ League, where she discovered the “tantalizing” feel of clay. She enrolled in another evening class at the New School studying with master sculptor Bruno Lucchesi. Still searching for her life’s work, she prepared to apply to the Columbia University Graduate School of Social Work, but an essay question on the application forced her hand. She moved back to Geneva and enrolled at L’Ecole des Beaux-Arts, where the training was rigorous – four hours with the professor of clay and four hours with the professor of stone every day. The professors were demanding, the standards high and the aesthetic well-defined. The classic training she received during her two years at the school is reflected in her work. “My two years at L’Ecole des Beaux Arts were extremely important in my training as a sculptor. The foundation I received there I put into practice every day. While I was at L’Ecole, abstract expressionism was taking over in the U.S. Thus, the emphasis on learning from the masterpieces of the past was no longer in vogue at the top American art schools. At L’Ecole des Beaux Arts, the opposite was true. My experience as a student there built an aesthetic that I continue to draw upon today. “To start, I was placed in the studio with life-size plaster copies of ancient Greek and Roman sculpture. I had to replicate these in clay to my professor’s approval. After two months in this studio, I was invited into the studio with a live model. There, we worked on a piece for two to three months. Every day, at 10:00 a.m., the professor would inspect and critique our work sculpture by sculpture. What he found unacceptable would be unceremoniously cut off with a sharp knife. This taught me humility and a deep appreciate for a time – honored aesthetic. She returned to Ann Arbor to the Masters in Sculpture program at the University of Michigan. It was mid-1960 and Gotoff’s figurative work, inspired by Henry Moore and Rodin, was in stark contrast to the abstract work of the era. It was during her final days at Michigan that she sought out a professor to teach her welding. He turned on the oxygen and acetylene, handed her the torch and she proceeded to teach her self. With her Masters in hand she left Ann Arbor and welded for the next fifteen years. With enough hours in arts education to be certified as a secondary school teacher, Gotoff supported herself teaching in Harlem and then in the Boston area, where she was assigned 800 students in 25 different classes each week. The landlord at her Boston area apartment allowed her to haul her welding tanks to the basement. There she spent every free moment, working primarily with fine steel rods from which she created large abstract pieces. However, she missed the figure and spent 200 hours creating a piece from bronze-coated welding rods. Realizing how much she had missed the medium and the “message,” Gotoff returned to clay and to the figure. Ironically, Gotoff’s first gallery show was not her sculpture, but her silk screen prints, which she created in her tiny walk-up apartment. Her minor in graduate school at Michigan had been printmaking. She was drawn to the possibilities of silkscreen where she could express her excitement with both form and color. Her prints, accepted into a prestigious Newbury Street Gallery in Boston, sold widely and one, “Tyranny”, is in the collection of the U.S. government. Once her prints were accepted into the gallery, she finally dared to show the gallery director her sculpture. He immediately asked to put it on exhibit. She moved to teaching part time, which allowed her more time to explore different media: wood, resin, cement, and bronze. She married Harry Gotoff, a classics professor at Harvard, and they moved to Rome when she was expecting their first child. She brought her welding equipment, but no one would allow a woman, let alone a pregnant woman, to use their welding shop. She returned to her silk screen prints, and had a show at The American Academy two weeks after the birth of their daughter. The family moved to the Boston area. Gotoff had a show at Harvard and also participated in two Salon Shows at Warde-Nasse Gallery in Boston. Then it was on to the University of Illinois in Champagne- Urbana, where Margot continued to sculpt and parent two young children, Leila and Daniel. She had several shows and her work was also represented in two galleries in New Jersey. In 1985, the Gotoffs returned to Rome for one year. There she worked in wax at her kitchen table. The year ended with a show of her collection of small bronzes and water colors at the Galleria II Leone in Rome. The family moved once again in 1986 when Harry Gotoff accepted a position at the University of Cincinnati. Margot earned her second masters, an M.F.A. in Sculpture, there in 1988 and then became a member of the adjunct faculty. She then taught for eight years at the Art Academy of Cincinnati. Recognition of her work grew steadily beginning in the late 1980’s. She participated in many shows a year throughout the United States as well as three shows in Italy. She was also winning awards for her bronzes .She received her first commission which was for a bronze portrait bust of William A. Hillenbrand, the founder of the Hill-Rom Company in Batesville, Indiana. This was followed by winning commissions for permanent public installations in Cincinnati, as well as Cherry Creek North in Denver, Colorado. She was also commissioned to do a portrait bust of a WWII hero for the Navy League of the United States. Gotoff’s work in bronze consists mainly of fragmented torsos. Her love of painters such as Botticelli and Vermeer and her background in the classics and art history strongly influence her work. Attending one of her classes at the Art Academy in Cincinnati was an enthusiastic gentleman who kept challenging her to cast her work in glass. (As it turned out he and his wife, David and Nancy Wolf, have one of the premiere glass collections in the country.) Thanks to his persistence, Gotoff began her love affair with glass. She took a short workshop and to better understand the medium she visited the Blenko Glass Works in West Virginia to meet with their glass engineer. For the past fifteen years, Gotoff has worked almost exclusively with glass. She employs the ancient lost wax casting process more commonly associated with bronze. Complex, lengthy and arduous, it starts with clay and the multiple steps that follow include the construction of molds weighing up to 300-pounds, melted wax, a computerized oven and temperatures up to 1500 degrees. Months after the first clay sculpture is created, and only if every phase of the multi-step process goes as planned, is she able to finish the glass sculpture with diamond files. Margot Gotoff’s glass sculptures have been shown in exhibits and museums throughout the country and are held in private collections in New York, Palm Beach, Houston, Chicago, Philadelphia, Cincinnati, Rome and the Royal Collection in Saudi Arabia. Her work can be seen in Cincinnati at the Marta Hewitt Gallery, Grand Central Gallery in Palm Beach, Hodgell Gallery in Sarasota and Gallery Vetro in San Antonio. In October 2009, Gotoff was named the recipient of the prestigious Ohioana Library Association’s Pegasus Award for her outstanding cultural achievements as an artist and teacher. The Ohioana Library Association, one of the oldest and most prestigious arts and humanities organizations in the state, kicked off their 80th anniversary at an awards ceremony where First Lady Frances Strickland presented Gotoff with the award. Introduced in 1964, the Pegasus Award’s past recipients include John Jakes, Erich Kunzel, Maya Lin, Rosemary Clooney, Gloria Steinem and Doris Day. For the past twenty-one years, Gotoff has worked at her studio in a dynamic arts-supportive Cincinnati neighborhood and for thirteen of those years, she has taught classes there.